Explorer and director James Cameron and other officials celebrated the launch of a cross-country expedition of one of the world’s most remarkable pieces of technology during the weekend. On Saturday, June 1, the DEEPSEA CHALLENGER, the submersible and science platform that Cameron piloted on March 26, 2012 on a record-breaking solo dive to the bottom of the Mariana Trench, began its voyage from the California Science Center in Los Angeles to its permanent home at the Woods Hole Oceanographic Institution (WHOI) in Massachusetts. Cameron, who donated the sub to WHOI and joined its Center for Marine Robotics to stimulate advances in ocean science and technology, spoke at the June 1 event, as well as WHOI President and Director Susan Avery. 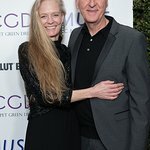 Suzy Amis Cameron, Founder of MUSE School CA based in Calabasas, CA. was also present. MUSE is dedicated to early childhood through 8th grade education with a sustainable focus. The bright green, 24-foot long DEEPSEA CHALLENGER was on display at the California Science Center between 10:00 a.m. and 2:00 p.m. before embarking on the trip. Scientists traveling with the sub across the country explained the remarkable human achievement of the DEEPSEA CHALLENGE expedition and the groundbreaking technology required for its success. “This cross country journey will give many more people the opportunity to see the sub and to be inspired by the exploration and scientific discovery it enabled,” said Susan Avery , president and director of WHOI. The sub’s trek across the U.S. comes a little more than a year after Cameron’s unprecedented solo dive to 35,787 feet, almost 11,000 meters (6.8 miles), to the deepest place on Earth – the Challenger Deep in the Mariana Trench – in the marine vehicle the “Avatar” and “Titanic” director and his team engineered. The DEEPSEA CHALLENGER was specifically engineered to be the first of its kind – a vertically-deployed, manned submersible and robust science platform capable of diving to full ocean depth. The sub’s ability to remain at the bottom of the Challenger Deep for nearly three hours to explore, sample and capture the first high resolution 3D images ever taken of the location, is unprecedented. In 1960, the Trieste, the only other manned submersible to reach the Challenger Deep, was able to stay only 20 minutes on the bottom before ascending. In March, 2013, Cameron donated the sub to WHOI. Upon its arrival in Massachusetts, WHOI scientists and engineers will begin to work with Cameron and his team to incorporate the sub’s numerous engineering advancements into future research platforms and deep-sea expeditions. This partnership harnesses the power of public and private investment in supporting deep-ocean science. Recognizing the power of new technologies, like those embodied in the DEEPSEA CHALLENGER system, to explore and understand the ocean, WHOI recently launched the Center for Marine Robotics (CMR), a novel collaborative model that enhances the development of robotic technologies by bringing together partners from academia, the federal government, and the private sector. The CMR’s scientists and engineers will revolutionize the way people and machines work together in the marine environment and enable new approaches to complex scientific challenges. 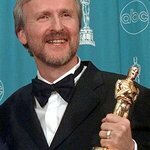 James Cameron will serve on the Center’s Advisory Board. DEEPSEA CHALLENGE, Cameron’s eighth deep-ocean expedition, marks a globally-recognized milestone in an exploration and diving career spanning decades. An avid scuba diver since 1969, Cameron has logged more than 3,000 hours underwater, including 500 hours in helmets. He has made 85 submersible dives, most of them to depths greater than two miles. Seeking to combine his two great passions — diving and filmmaking — Cameron has directed numerous feature films and marine documentaries that have broken new ground in underwater cinematography, beginning with The Abyss in 1989. In 1995, he made 12 manned-submersible dives to the Titanic wreck for his feature film of the same name, which won 11 Oscars, including Best Picture and Best Director, and broke the record for global box office. Titanic’s earnings have only been surpassed by Cameron’s 2009 film, Avatar, which garnered an unprecedented $2.8 billion worldwide. DEEPSEA CHALLENGE was a joint scientific expedition by James Cameron , the National Geographic Society, and Rolex. Learn more at deepseachallenge.com.